Mathieu Contravel (construction contractor) left a will. According to him, it was necessary to trim the chapel in the church. He chose a specific topic and the required amount. The contract was signed with the famous painter Cesari d Arpino. He was once a rival Caravaggio. But since he was simply overwhelmed with all sorts of orders, in 1599 he was able to issue only a vault. There were serious concerns that the right time painting would not be finished. The arrangement with d Arpino was broken. We decided to entrust this responsible case to Caravaggio. Prior to that, he was engaged in private orders only. This work was his first attempt at writing to a wide audience. The painter decided to completely abandon the traditional frescoes. He preferred large canvases. 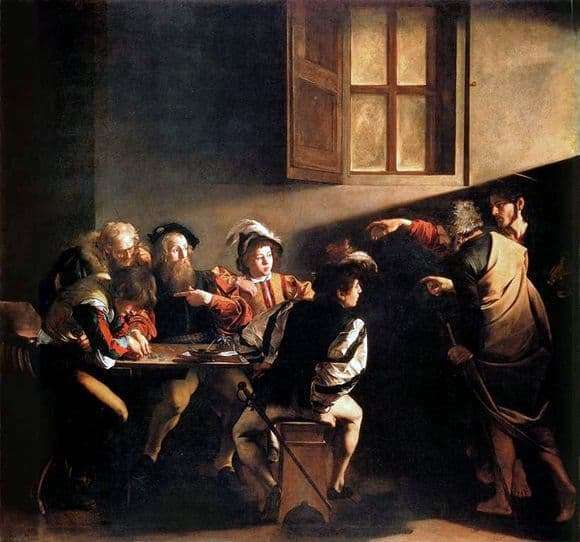 “The Calling of the Apostle Matthew” – the first picture. This artist’s work is rightfully the best creation, created on a rather rare plot. Matthew saw Jesus himself and decided to call him to serve as an apostle. The treatment of Caravaggio is different. He portrays this story as one of the scenes of ordinary life at that time. We see a dark room. People sit and count revenue. The young people turned around and attentively looked at those who entered. Matvey is dressed poorly. No one understood who he was except Levi. The darkness is broken by the stream of light in the place where Jesus and the apostle Peter is. This is a symbol of faith, which suddenly broke into the world. Our view is strictly organized by the way it is directed. We unwittingly read the whole scene, starting from the left. We can only see the hand and head of Jesus. He came here only for a minute, as his legs were turned towards the exit. Here the same gesture was repeated three times – an outstretched arm. Many researchers believe that this is not accidental. We understand the language of the artist. That is why his paintings were and remain so popular.